From the up late, can't sleep department... Bone Thugs~n~Harmony @ Emo's on March 6th! Brings back so many memories... Bone Thugs was the first show I saw after coming to UT. The show was at the Erwin Center and is still one of the best shows I've seen. I recall the stage props were just sick. Since then, Bone Thugs are not quite the same, hopefully they can still put on a show. 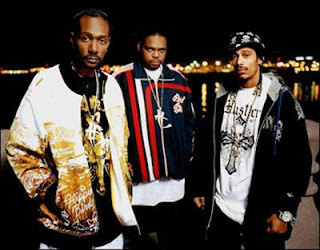 Bone Thugs-n-Harmony is an American hip hop group from the Glenville section of Cleveland, Ohio, best known for their high pace rapping style and harmonizing vocals. In 1997, the group was awarded the Grammy Award for Best Rap Performance with their song "Tha Crossroads." Since its conception in the early 1990s the group has been honored with numerous other awards. Formed in the early 1990s, the group consisted of four members: Krayzie Bone, Layzie Bone, Wish Bone and Bizzy Bone.Their first album, Faces of Death, was recorded under the name of B.O.N.E. Enterpri$e in early 1993. Their career took off in 1993 after heading to Los Angeles in search of famous producer and N.W.A. member Eazy-E. In hopes of securing a record deal, the group was given an audition over the phone receiving an unfulfilled promise from Eazy-E to call them back. Discovering that Eazy-E was performing back in their hometown of Cleveland, the group took a charter bus back hoping to have another chance, this time in person. This chance was given backstage as they auditioned for Eazy-E. This resulted in them signing a contract with Eazy-E's Ruthless Records.